The mainstream 1080p graphics card you've been waiting for? Just a couple of weeks after the launch of AMD's mainstream-friendly Radeon RX 480, Nvidia enters the fray with its own pitch to the more value-orientated gamer. The new GeForce GTX 1060 is pricier than both of the Radeon RX 480 SKUs - and it loses two gigs of VRAM compared to AMD's 8GB offering. 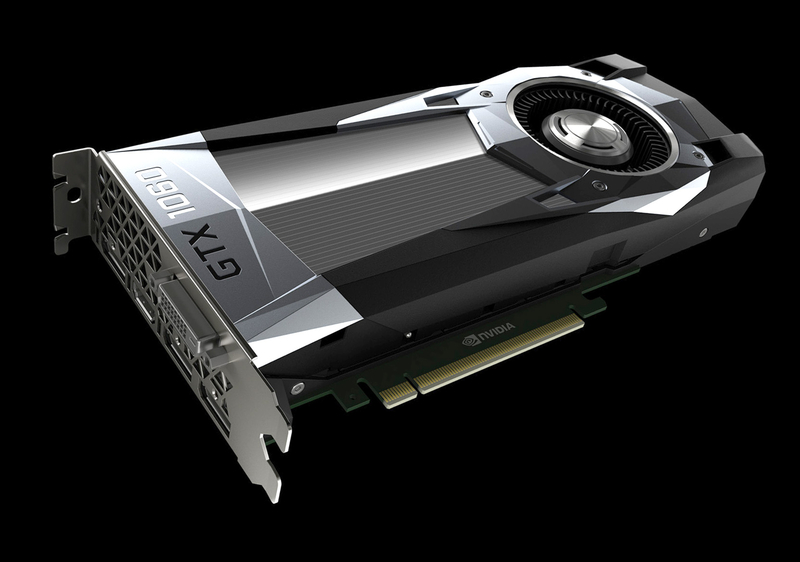 However, Nvidia hopes that the extra power on offer makes the difference, promising GTX 980-level performance. Two years ago, that would have set you back £430/$550. Today, thanks to GTX 1060, it's £240/$250. That's a highly attractive proposition but the question is, does the product fully deliver? Based on the new GP106 chip using the latest cutting-edge Pascal architecture, Nvidia's cut-down processor has much in common with its last-gen equivalent, GM206. The firm has taken the current top-tier example of its gaming technology and cut the CUDA core allocation in half, yielding 1280 shaders. It was a recipe that made for a 'good but not great' product in the form of GTX 960, but Nvidia has taken steps to improve performance this time around, and as the benchmarks across this page demonstrate, there's a game-changing leap in performance here. There's no anemic 128-bit memory bus this time around - instead, Nvidia has kitted out GTX 1060 with a 192-bit interface, backed by 8gbps GDDR5 memory modules, giving us a total of 192GB/s of bandwidth. That's a big boost compared to GTX 960, but some way short of the 256GB/s you get with the Radeon RX 480 in its 8GB guise. The memory set-up effectively limits GTX 1060 to either 3GB or 6GB of VRAM - but thankfully Nvidia has shelved any plans for the former, meaning that all GTX 1060s ship with six gigs. This gives us a good balance of rendering power and framebuffer memory, and a good degree of future-proofing for 1080p and 1440p gaming. CUDA core count drops by 50 per cent compared to GTX 1080, but reductions elsewhere are less severe than GTX 960, particularly in terms of ROP count and memory bandwidth. The 200mm2 die-size makes it around 10 per cent smaller than its AMD competitor, Polaris 10. This is the fully enabled version of the GP106 processor. The Nvidia GeForce GTX 1060 costs £240/$250/€280 though the Founders Edition reviewed here comes with a price premium, taking it up to £279/$299/€319. Partner cards should be available on day one and the FE will only be available directly from Nvidia. In terms of the physical properties of the card, we're reviewing the Founders Edition here, a limited release available only from Nvidia. It shares the design language of the more expensive cards in the new Pascal line, but the big difference is that we're getting a plastic chassis here. It still looks and feels fine, and the IO port selection remains the same - three DisplayPorts, one dual-link DVI and an HDMI 2.0. SLI expansion fingers on the top of the card are missing though, meaning no multi-card support. It's unlikely to impact the vast majority of the intended audience, but it does seem just a little mean-spirited to remove this feature for the minority who would have enjoyed exploring it. Rich presents his video review of the GTX 1060 - does the mainstream Pascal card truly deliver GTX 980-level performance? Rounding off the list of distinctive features is Nvidia's class-leading power efficiency. With GTX 1070, the green team handed in Titan X-level performance while lopping off 100W (!) from the power budget with a 150W TDP. GTX 1060 continues the trend with a mere 120W TDP, with power supplied via a single six-pin PCI Express power cable. This should provide ample juice for overclocking, where Nvidia claims that the GTX 1060 should be able to hit 2GHz on standard air-cooling. So we'll begin with a look at 1080p performance, where we stack up GTX 1060 against GTX 960, 970 and 980 - and we'll factor in the AMD competition in the form of the 8GB version of the RX 480 and the similarly priced R9 390. AMD recently released a new driver that solves RX 480's over-spec power draw issues and also features Polaris-specific performance optimisations. Rest assured that these are updated figures, but in truth, we're only looking at 1-2fps improvements over the launch driver. We've also re-benched Rise of the Tomb Raider on DirectX 12, which was recently kitted out with a new upgrade that supports asynchronous compute. This adds a small boost to overall AMD performance, but doesn't amount to any game-changing difference - Nvidia still has a strong lead here. At 1080p, the GTX 1060 mostly lives up to Nvidia's claims of GTX 980-level performance, though the old cards wins out in a couple of games. RX 480 is slower, but holds its own in Hitman and Ashes of the Singularity. Nvidia says that GTX 1060 is "on average 15 per cent faster and over 75 per cent more power efficient than the closest competitive product at stock speeds". We'll talk about power efficiency later on, but assuming the firm is talking about RX 480 as the competitor in question, GTX 1060 doesn't quite deliver in our test suite. Assassin's Creed Unity delivers the requisite 15 per cent increase, while Rise of the Tomb Raider sees that rise to 23 per cent, but elsewhere we're looking at gains in the 11-12 per cent area (Crysis 3, Far Cry Primal, The Witcher 3). The Division sees GTX 1060 inch ahead with just a three per cent lead, but AMD favourite Ashes of the Singularity has its own three per cent advantage with RX 480. Meanwhile, Hitman on DX12 continues to confound Nvidia hardware - we have RX 480 offering a big 11 per cent boost here. The claims that GTX 1060 offers GTX 980 levels of performance depends on the titles you choose to test. Assassin's Creed Unity offers an uncanny level of parity, Far Cry Primal takes a four per cent lead, while The Witcher 3 is seven per cent faster. However, elsewhere we see GTX 980 take point. Sometimes it's just a tiny lead within the margin of error (The Division/Hitman) but we actually found Rise of the Tomb Raider to have a significant seven per cent advantage on GTX 980. Bearing in mind that Nvidia previously built some wiggle-room into its claims (GTX 1070 is actually faster than Titan X, performing better than advertised), this did come as some surprise. Overall though, by and large, you do get a similar experience and GTX 1060 is clearly faster than the old 970. All of these cards are capable of good 1440p performance, but the RX 480 and GTX 1060 have the additional VRAM that ensures you're future-proofed. As we move onto the 1440p benchmarks, it's pretty much the same story. In terms of GTX 980 comparisons, the new card is within margin of error on Assassin's Creed Unity, Ashes of the Singularity, Far Cry Primal and Hitman. It's three per cent faster in The Witcher, but four per cent slower in The Division and almost nine per cent off the pace in Crysis 3. It also lags in Rise of the Tomb Raider, where once again, GTX 980 has a seven per cent lead. Against AMD's RX 480 there are big wins with Tomb Raider (14 per cent), Assassin's Creed Unity and Crysis 3 (both at 11 per cent) but perhaps not surprisingly, Ashes of the Singularity and Hitman continue to deliver the goods for AMD. Elsewhere, GTX 1060's wins are somewhat more slight - two per cent and six per cent ahead on The Division and Far Cry Primal respectively. The end result looks pretty clear-cut. GTX 1060 does have some good performance wins over the RX 480, but AMD is still clearly in the game in several titles - not a bad position to be in when the product is a touch cheaper and comes with more memory. By and large, Nvidia's new card does offer an equivalent experience to GTX 980, but the Maxwell cards were renowned for their excellent overclocking and thus far, Pascal replacements haven't quite matched up in this regard. That's not to say that you can't get an impressive enough increase via overclocking though. Getting the GTX 1060 to Nvidia's stated 2GHz is a piece of cake, and in actual fact, we could take the core a little higher to 2050MHz. Similar to GTX 1070/1080, you can push harder, but any clock increases quickly drop back down again to settle at the 2.05GHz level. The new card seems to have the same 8gbps memory modules as GTX 1070 - you can overclock these to 9gbps with very little effort, just by adding a +500MHz offset in your overclocking tool of choice. An overclocked GTX 1060 effortlessly pulls ahead of a stock GTX 980 and absolutely monsters a reference clocked GTX 970. By adding 210MHz to the core and 500MHz to memory, we gain between 11 to 15 per cent of additional performance, depending on the game. However, in this respect, we must remember that the old Maxwell cards were relatively brilliant overclockers, and getting most of the theoretical max performance out of anything from a reference-clocked GTX 750 Ti all the way up to Titan X was simply a matter of increasing core clock by 200MHz and memory by 400MHz (800MHz effective). Obviously those offsets would need to be tuned down if you own a factory overclocked card. When we do this, we find that GTX 980 pulls ahead in many titles - and could inch a couple of fps ahead if we were more aggressive in with our OC profile (pushing core/RAM to the limit, over-volting etc). This very simple +200/+400 overclock also brings GTX 970 into contention, inching ahead of the GTX 1060 at stock clocks though the newer card more than holds its own once an OC is in place. It may be tempting to grab a bargain there with an older card, but really you'll be looking for a GTX 980 to see any kind of appreciable boost over the GTX 1060 - and thus far, discounts on the old flagship haven't been that enticing. On top of that, the extra two gigs of RAM on GTX 1060 is bound to come in useful at some point - probably more than the small performance increase. Also in GTX 1060's favour is that it seems clear that the implementation of new DX12 features like async compute will be the preserve of Pascal cards, with the chances of Maxwell support looking less likely. When it comes to power consumption, it's plain to see that Nvidia has delivered again with class-leading performance per watt. Judging by our peak system power consumption metric, swapping in a GTX 1060 from a GTX 980 saves 75W in the same scenario, dropping to 65W with GTX 970. We've yet to re-test RX 480 with an overclock in place on the new driver, but based on the old one (which apparently diverts power draw away from the motherboard slot and towards the PCI Express input with the same net draw), GTX 1060 is offering significantly improved performance with a 40W saving. Even with an overclock in place, GTX 1060 is still way ahead of the competition, gaining just 18W - by comparison, RX 480 power consumption increased by 44W in our testing. And there's one more point to factor in with regards GTX 1060's advantages over the older Maxwell cards. Lower power consumption means a less capable power supply will do just fine - and remember, only one six-pin power input is required here. On top of that, we note that the PCB for the GTX 1060 is rather small - the Founders Edition is longer owing to the size of the fan. We suspect that mini-ITX solutions aren't too far away, and this would be a great card for a living room-based gaming PC in a small form factor chassis. Nvidia's ability to support asynchronous compute has been a matter of heated debate. Futuremark's new TimeSpy DX12 benchmark is tested here, with async on and off. AMD gains around 12 per cent, double Nvidia's boost with async enabled - but it does demonstrate that the feature is active on Pascal. GTX 980 testing shows that Maxwell gains nothing here. When we first heard the $249/£240 price-point for the GTX 1060, we could almost hear the sigh of relief emanating from AMD headquarters. In terms of price vs performance, the 4GB version of the RX 480 remains in a class of its own - and we wouldn't be surprised to see a 3GB GTX 1050 with a cut-down GP106 processor take that on in due course. As things stand, the 8GB RX 480 is cheaper but slower than GTX 1060 overall. However, it retains a RAM advantage and, by and large, it seems to be holding its own in titles that favour Radeon hardware. The state of DX12 performance in the mainstream sector is something we're planning to investigate in more depth soon. In terms of value when judged alongside other Nvidia products, the GTX 1060 offers a good deal. At the time of writing, Newegg is still offering GTX 970 at $299 - higher than the 1060's ticket price - and while UK suppliers are clearing out Maxwell stocks, we've still yet to see GTX 980 hit anything like the GTX 1060's price-point. If there's the sense that the GTX 1060's UK pricing is simply too high compared to its $249 US counterpart, the unfortunate reality is that the recent collapse of the pound's value has had a big impact on PC component pricing across the market. And so effectively what we have here - judged by UK pricing, at least - is a more iterative upgrade to the classic GTX 970: a welcome slice of additional performance, improved efficiency and an extra two gigs of VRAM at a broadly similar price-point. Combine that with some potentially very exciting technologies like simultaneous multi-projection (which should provide a huge performance increase to VR applications, assuming we see developer support) and we have a worthy product. It's not a knockout blow to AMD - but GTX 1060 offers a compelling package overall.